In addition to our wide selection of beer and wine we also have a diverse selection of Bourbons and Whiskeys. Cheers. Nose: Rich and flooding with almond toffee, ripe banana, vanilla, sweet spices, popcorn, and a tangy sweetness of sorghum and molasses. A scant teaspoon of water to a 2 oz. pour ramps up the spices, dried fruits, and deep oak notes. Palate: On the palate this bourbon just hits you with flavors in waves and it keeps on coming. Few whiskies can match it in that department. Deep dark sticky caramel, Rum Bananas, vanilla, Dried Dark Fruits, root beer, fudge, and intense sweet spices of cinnamon, clove, and mint are dominant when sipped neat. A teaspoon of water brings out the barrel flavors and rounds out the alcohol edge and heat. Finish: Candied sweetness, smokey oak, and woody spices. Very long. 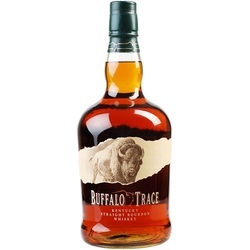 Overall: The Buffalo Trace Antique Collection produces five of the most highly anticipated releases each year. Finding them can be a real pain in the rear. Allocation of this stuff, particularly the bellwethers of the group, George T. Stagg and William Larue Weller, is frustrating. Both are huge whiskies at barrel proof, but certainly different. George T. Stagg is the leader of this pack. Some may argue Weller or one of the ryes (Sazerac 18 or Thomas H. Handy) are better, but I don’t think anyone would argue that Stagg is probably the single biggest bruiser of a whiskey on the planet. At 140+ proof, it packs a hell of a punch. Some may find it lacks a little grace and tact akin to taking a bazooka to a knife fight, but there is no arguing that it’s special. It’s also fun to sip a whiskey that is over 1.5 times the strength of todays more standard 90 proof offerings. But if that sounds like a novelty only, it’s not. George T. Stagg is is seriously fantastic whiskey. I’d recommend taking all the time you need and enjoy this one neat first. But for me, a splash of water helps to cool the alcohol flames enough to where those flavors shine even further. Don’t dilute it too much – after all you bought it for the beast that it is. Nose: Incredible aromas! Intense Maple Syrup, sweet corn, vanilla, candied dried fruits, rum soaked berries, and gentle oakyness. Flavor: Maple syrup, corn, dates, raisins, and clove coat the palate. There’s a ripe plum/grapey flavor that adds a fresh fruitiness. Finish: Sweet maple, toffee, hints of soft spices, and a lingering fruitiness remain. Overall: Angel’s Envy is a fun whiskey to sip and savor. It’s ever so smooth, sweet, and fruity – definitely one of the best pours I’ve had this year. The nose for me is the star of this show – a real masterclass. It may be just a tad light on the palate, which has me anxiously awaiting their (reported) barrel strength release at the end of the year. Regardless, this is mighty fine bourbon. Highly recommended. Nose: A complex arrangement in spite of the price. Bright corn graininess, vanilla, golden dried fruits, and tobacco are lifted with a hint of rye, oak, and mint. Palate: Sharp and lively. The front entry is sweet corn, vanilla, a prickle of rye spice, and a crackle of burnt sugar. The sip moves swiftly toward drying from mid palate on to the finish, with a fantastic toasted oak flavor. There’s a gentle bitterness as well that adds interest. This is not a cloyingly sweet, thick, syrupy whiskey, but rather quite elegant in it’s delivery. Finish: The finish is more of what started mid-sip; moderate length with bitter char, toasty oak, licorice, and mint. Overall: I have to remind myself I am drinking $20.00 whiskey when I drink this stuff. It just tastes much pricier. I consider it one of the finest values in whiskey because of that. It’s not ridiculously sweet and flabby like other less expensive bourbons typically are. What I enjoyed most about it was the sharp, bright, graininess without tasting rough and raw. It’s pretty refined stuff and very well made. Highly recommended. The first batch of Stagg Jr. is comprised of barrels aged for eight and nine years. The proof weighs in at a whopping 134.4 proof (67.2% ABV). Future releases will undoubtedly be different proofs, as each batch is unique and no water is added. Just like George T. Stagg Bourbon, this new whiskey is not filtered and offers all the rich and complex flavors of bourbon right from the barrel. 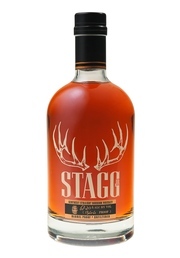 Bottles of Stagg Jr. will be limited, but several batches each year are planned. 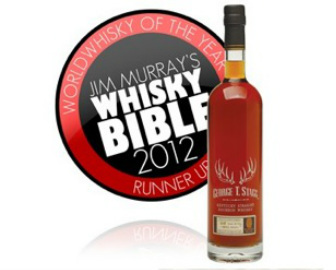 This new Stagg Jr. offering will not affect the stock of barrels already set aside for future George T. Stagg releases. The nose really draws you in because it has very little alcohol smell, what you do get is butterscotch, raisins, vanilla and a firm sense that you’re in for something very good indeed. Upon first tasting, I get brown sugar and vanilla mostly with a hint of oak and the rye makes its presence known in a very subtle way. It has a nice, soft sweetness, but not overly so. Many say they get tobacco notes as well. Following on this initial sensation is a balanced presence of dates and a touch of orange. The finish is tricky, it weaves that blend of fruit and brings back the sweetness very nicely. What I mean by tricky is that you think the finish is done but it has a tendency to sneak back up on you, giving this whiskey really amazing character. 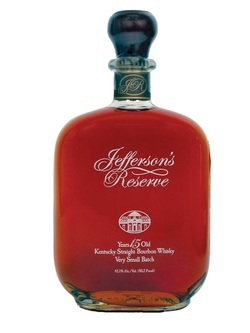 From these descriptions, it sounds like Jefferson’s Reserve is a complex whiskey, but it isn’t really at all. What is does deliver is a consistently, satisfying bourbon experience. I normally drink this whiskey neat, but adding a little water does wonders, it adds a little pepper to the subtle rye and you can get some raisins in the fruit layer. Nose: Corn, apples and apricots, cinnamon, rye, and a little caramel sweetness adds weight. Flavor: Corn, orchard fruits (apples, peaches), bracing rye spice, and the bitterness of charred wood. Finish: Baking spices, fruit, maple syrup, and barrel yield a moderate length finish. Overall: Blanton’s is a wonderful expression of a rye recipe bourbon full of grain and barrel aromas and flavors. It is also accessible and relatively easy drinking. My only complaint is Blanton’s flattens a bit on the palate. I would love to see this at barrel proof as Colonel Blanton used to sip it. Buffalo Trace, are you listening? Maker’s Mark 46 is the first true (read: not limited edition) product line of bourbon that Maker’s Mark has produced in over 50 years. Talk about pressure! With a “finishing” process to the tried and true, but somewhat flat, Maker’s Mark original, Kevin Smith (Master Distiller) and Bill Samuels Jr. (CEO) have delivered with a pretty impressive bourbon whiskey. Maker’s 46 opens up far bigger and fuller than its little brother with intense vanilla, caramel, maple syrup, toast, cinnamon, and baked apple. It’s really a masterclass of Bourbon noses with sweetness and high notes of spice. The first sip assures with that smooth, sweet “front of the mouth” flavor of caramel and vanilla that are so familiar with the original Maker’s Mark. “46″ takes that a couple notches further with heaps of maple syrup and honey. The major difference between these two family members is almost immediately felt down the top center of your tongue. Intense cinnamon bite akin to fireball candy or big red chewing gum emerges. There’s a hint of wood tannin and bitter grip that asserts itself as the spirit runs it’s way to the back of your throat. In this moment, this bourbon is telling you, “See – I’m very different!”. The finish is long and lingering with cinnamon burn and toasted oak. 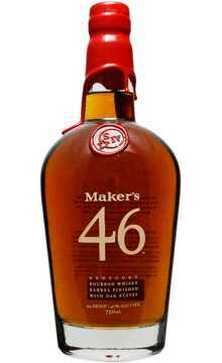 Maker’s Mark 46 is an outstanding pour that is a recommended “buy” for any bourbon or whiskey lover. Glass Nose: A potent and forthcoming, strange and daunting, yet intriguing aroma … what on earth is this … and just how do I explain what it is like!? Maybe raison-scented industrial cleaning fluid, wet cardboard, and a ton of fresh-cut wood. This is not like anything else I’ve ever encountered, and in fact, not much like anything even edible. The nose is really not bad, but neither is it greatly appealing. After a bit of water, we might find a few additional notes … perhaps some burnt caramel and cinnamon. Bottle Nose: The next day the bottle made available lovely and luscious scents of fudge, chocolate, vanilla and butterscotch, over the still very woody background. Some hints of herbs and flowers can be noticed if you are quiet. Palate: A very small sip offers a pleasant, flavorful, surprising soft, and velvety semi-sweetness … all accompanying an eye-lifting and very novel flavor … perhaps a flowery or herbal essence. The palate continues on with potent freshly squeezed wood juice, with a dusting of cinnamon, paprika, anisette and pepper. Finish: This is a medium-long, and quite satisfying finish … with a sustained and regulated dose of warmth, with nothing harsh or unpleasant. The very end leaves you with a slightly bitter and dry aftertaste. At times, a bit of youngness may bleed through, but if you control the method and size of your sips, you probably will not even notice.